Company Farm Update: New Potatoes! Small, “new potatoes” harvested during a round of weeding. Varieties include Superior, Chieftain and Carola. Company Farm, our project to grow food for those in need, is well into its pilot year. So far, so good! Our goal: Grow potatoes in our corporate “backyard” (Burlington, VT), using volunteer gardeners from the staff. The entire harvest will be donated to our local food shelf. When it comes to pests and diseases, we couldn’t have picked a more challenging year to start. The combination of heavy, constant rain followed by high humidity has created ideal conditions for bad things, such as blight. To help us monitor the 30 raised beds for signs of trouble, we have partnered with a farmer, Robert Young. We’ve been alert, watching usablight.org to track the progress of late blight, and staying connected with our local community of farmers. Thankfully, we have been spared from Colorado potato beetles, though we are now battling leafhoppers, an insect pest. So far, we’ve seen no signs of late blight. A portion of our farm was planted with sweet potatoes, which have been hit hard by deer. Next year, we’ll need a fence. Fortunately, the deer have left the regular potatoes alone. The best news: Potatoes are forming! 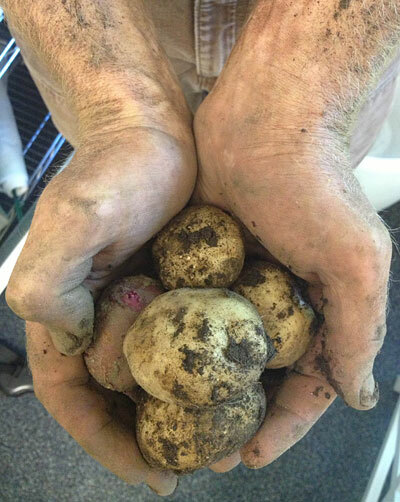 During a round of late-July weeding, we harvested a few new potatoes, a sign of things to come. If all goes well, we’ll harvest in early September. I was so moved by your garden. We have a community Garden in Galena, Il. There are 102 garden 10×10 lots. garden. Maybe I could be of assistance to you in some way.